Your spells and products have brought about fascinating experiences in my life which I strongly believe would not have happened under normal circumstances. You do honor your unconditional guarantee, and I find your services...simply professional! CAA is just so cool! I used the one year guarantee and they fulfilled my wish. Their response was very quick, and I am really glad to have found CAA. Continue the good work CAA!! At the California Astrology Association, we understand that you might be skeptical about the power of spell casting, metaphysics, and astrology. But we're not. We are so sure that our products and services will work for you, we offer an unconditional ONE-YEAR money back guarantee. So, you've got nothing to lose! If you are not completely satisfied with any item or service you buy from us, we will refund your money for up to one full year after purchase. Everything we sell is guaranteed. Period. There is no fine print. You can return anything, up to one full year, for any reason. When our guarantee was introduced in 1970, some customers were skeptical. Friends and business acquaintances told us we were being foolish. However, it's been one of the keys to our success. We cherish our thousands of repeat customers, many of whom we know by name. 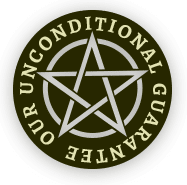 Our one year unconditional guarantee assures our customers they will be satisfied, or they will receive their money back. Period. No questions asked. I have ordered many products from your company and will continue to do so for a long time. Your service is quick, efficient and your staff is very helpful. The extra courtesy of e-mailing me to let me know that my order was shipped makes me feel like the staff is truly working to make their customers happy. The ordering process is quick and easy and a joy to deal with your company. I give CAA two thumbs up!!! CAA is an excellent company! Their products are first rate and they truly care about customer service and their money-back guarantee is real. What I really love about this company is their commitment to helping people. They are a reputable company. Their products and services really do work and your money is best spent here than with those 900 numbers and other so called psychic ripoffs. CAA can really help to improve your life and they want you to be satisfied! If you are truly ready for a better life, order from CAA today! These do-it-yourself spell kits are powerful, spiritual rituals and are not to be taken lightly!